Friday morning I was standing on the Habitat construction site, chatting with Assumption football captain Nick DiAntonio, when my father, Charlie, sidled up, his camera hanging from his neck. When I started to mention Nick’s name, my father grinned; he’s already read the article about the Greyhound in the Boston Globe. “Linebacker, math major, 3.8 GPA,” my father quipped, surprising Nick, and even me – although I shouldn’t have been. Of course Dad would’ve absorbed the key identifying information. Once a sports writer, always a sports writer. My father knew Paul “Bear” Bryant from his arrival at Alabama through the glorious decade of the 1960s, and sports a national championship ring Bryant gave him after the 1961 season. Even more of a sign of how football pervades every part of life in Tuscaloosa, my father was the second person the students had met with a national championship ring – construction volunteer James Shackelford earned his as a safety on the 1992 team that upset Miami in the Sugar Bowl. “I saw Nick and I could tell he played,” James told me. Working in a neighborhood where a tornado killed six people, is it frivolous to care so much about a game – or, in the face of such tragedy, is it spiritually healing to embrace whatever unites people in a sense of transcendent joy? Tuscaloosa tends to suggest the latter – which is saying in a city still bearing the six-mile-long scar from last April’s tornado, which killed 52. As trivial as sports seems against such a backdrop, the normalcy of such diversions helped people keep their bearings: On April 28th, a little more than 24 hours after the tornado knocked out cable and internet at my father’s place, I called from a Worcester sports bar, reading the ESPN crawl summary of which Tide players went where, sure to note that with Mark Ingram going to New Orleans and Julio Jones to Atlanta, he’d get to see plenty of both in regional TV coverage. For this Tuscaloosan, the above is old news. 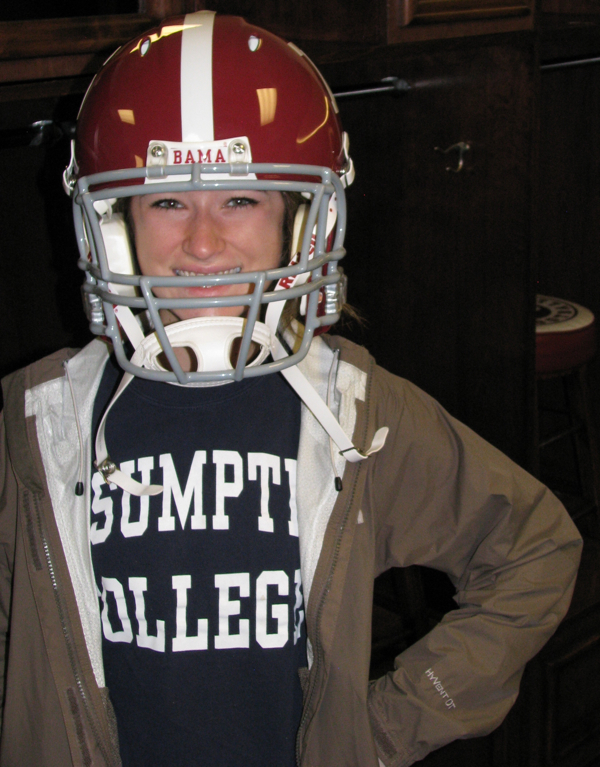 The surprise, however, has been the ease with which Assumption students, New Englanders all, have adopted the Crimson Tide cause. What Assumption students have shown this week is how, once one learns to give one’s self over emotionally to being a fan, it’s easy enough to shift those sympathies to other teams and other regions – putting themselves into the shoes of others, if not their actual cleats. To this, add the outward-turned nature of students who choose to spend college breaks on service immersion trips – they’re eager to throw themselves into both the work and the culture. 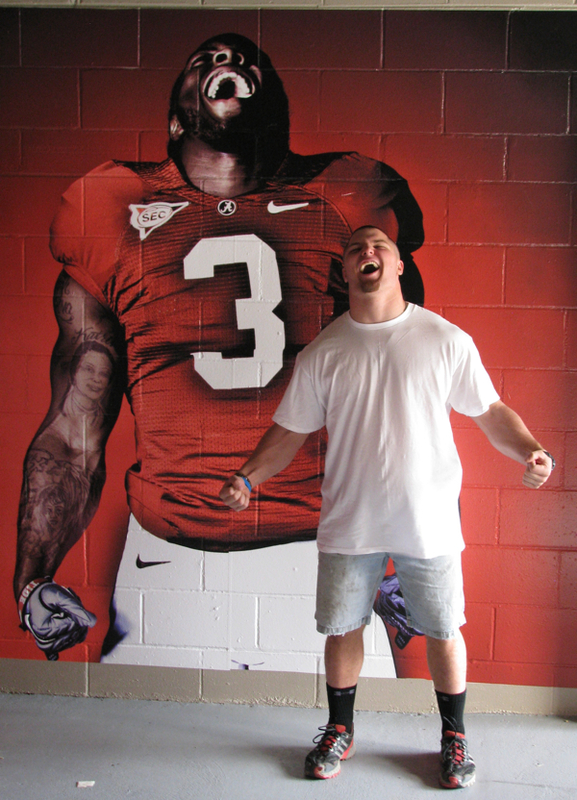 I saw this more clearly Saturday, when Jared Patterson, project coordinator for Habitat for Humanity Tuscaloosa, gave Assumption students something any Tide fan would covet – a tour of the Alabama locker room and a run across the field of the 100,000-plus Bryant-Denny Stadium. Our students wandered through players lockers, posed by portraits, even made a giggling incursion into the showers. 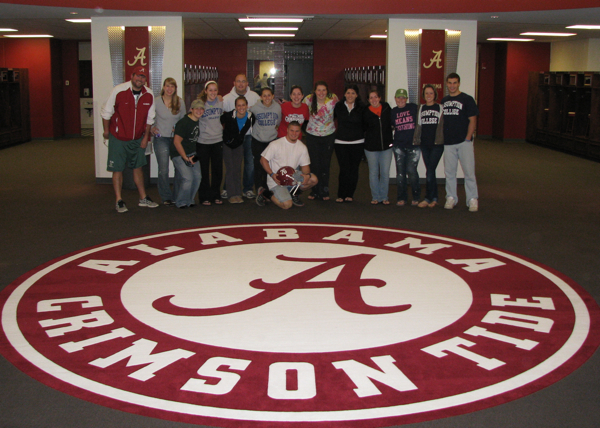 Being our students, of course, they adhered to the one cardinal rule – not stepping on the large circular Alabama logo in the locker room. They wrote Assumption’s name on a dry-erase board – next to that of a Habitat group from the Midwest – and gawked at what a student called the “mind-boggling” scope. But if the culture here – or anywhere in America – inevitably leads to sports, the reverse is also true. As Jared spoke to us in the north end zone, he pointed toward the opposite end, where he was standing when he saw the tornado. “When I was watching, it was probably right where you’re working now,” he said. Beyond that, though, it underscored that, as much a cliché as it is, Southern hospitality can really be a force – particularly when extended to a group of college students who have journeyed from Massachusetts to help rebuild a town. While we were busy working, Shackelford was working angles to get us coveted seating for Monday night’s game in Wings Sports Grill, owned by Bob Baumhower, former Bama and Dolphin defensive lineman. Someone asked where Patterson was watching Monday night’s game. “Well …” he said, grinning. Of course. Patterson would be watching the showdown at a little hangout called The Superdome. That’s right: The game against Louisiana State University unfolds in New Orleans, itself site of a greater but similar catastrophe. Despite the hoopla about Monday’s football rematch, these days Alabama and Louisiana share a similar sense of loss – and a sense of what it means to rally against obstacles that aren’t going away any time soon. The very organization that’s hosting us this week has only one other location – New Orleans. Of course, the agency’s name, United Saints, yokes moral virtue and football. If getting back to the business of Mardi Gras was spiritually important, the night the once-lowly Saints won the Super Bowl was downright miraculous. By sheer coincidence, my father and his wife were in New Orleans that night, seeing people run up and down the hotel hallways screaming in joy, then wandering into the packed streets in search of the action. 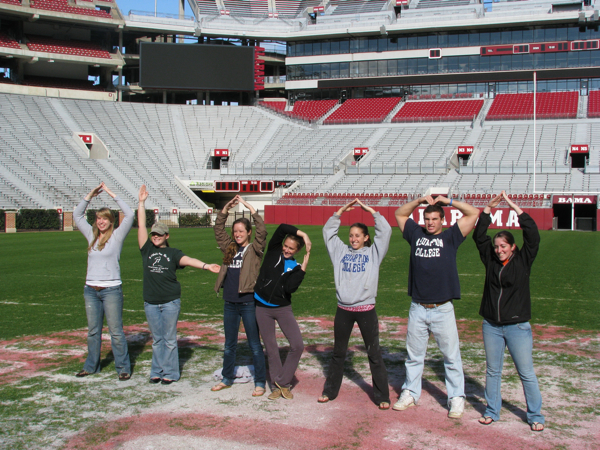 AC students trying spelling Alabama literally, as well as figuratively. Very cool piece, professor. The pictures really worked well with the blog. I enjoyed reading it. I would’ve enjoyed being there as well. Take care.